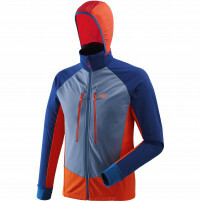 Like the jacket, the Millet Touring Intense Pant is designed to eat up elevation gain. 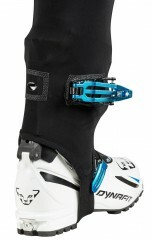 The body-hugging X-Fit™ design is efficient for climbing and skiing. Stirrups and boot buckle cutouts mean you don’t have to fuss with your cuffs during transitions. The comfortable elastic waist is adjustable with a pull cord and stays in place. The Touring Intense pants are lightweight, breathable, and born to skin. 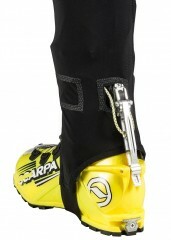 Ergonomic cut with articulated knees allows resistance-free skinning. Elastic waistband has a drawcord adjustment to dial in the daily fit. Bonded cuff patches can be cut out for various boot-buckle systems. Zippered waist pocket is nice for the one or two items you must carry. Hardtex™ scuff guards have gripper elastic to stay place over a ski boot. Revolutionnal® Energy Knit fabric is abrasion resistant and just plain fast. I'm becoming increasingly fond of wearing lycra all the time, but more so separates than suits for anything other than racing and in-bounds training. And for pants/tights, I'm going lighter & lighter to the point where in warm temps all I want is essentially the bottom half of a race suit. But I still do want a secure pocket. From some of my favorite race clothing companies, apparently yes -- why can't they include even just one little pocket on their skimo tights, especially when their workout/running tights include a pocket? Fortunate Millet has heard my plea: these pants/tights are exactly what I want! And although the pocket is pretty much imperceptible with nothing in it, it is nevertheless big enough even to have excess space for a Pieps Micro beacon. For fit, as with other race clothing, a Euro Medium is perfect for me. Just remember though that with Millet a Euro Medium is still a Medium over here, in contrast to much of the competition that relabels a Euro Medium a Small in the U.S. (and so on for other size translations). Millet Touring Intense Pant on the summit of Mount Shasta (Father's Day, 2017).